It is set at 90 degrees to the house, within easy working reach. It is designed as a threshing barn - with the doors opposite each other, in line with the prevailing wind. "They also had a bull, which was kept in the pen in the Building A byre. 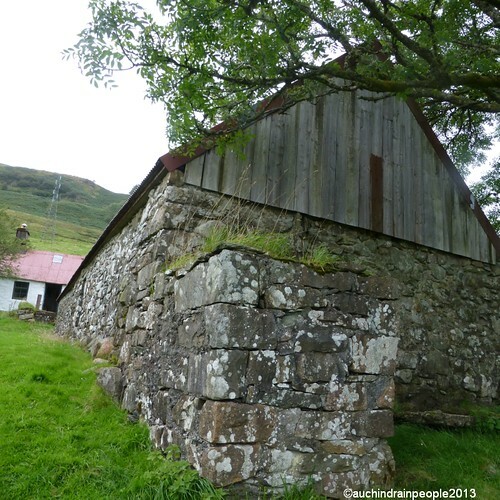 The building A byre only contains standings for five or six cattle, and AMcK cannot remember where else cattle were kept in the winter"
It does not seem that this barn was is much significant use at this time? In 1904, McCallum's barn had a thatched roof the same as MacCallum's House (building A) and was larger in scale with a cart shed attached to its southern end. Inside MacCallum's Barn, close to the lower door, is a stone protruding from the wall. This was used as a simple method of thrashing corn to feed the hens. Bundles of grain on the stalk were lashed against the stone to loosen the grain. It was also a way of getting clean unbroken straw for use in ropemaking or basket weaving. NEED Full Description from Museum Listed Buildings catalogue.